The Sanford Fieldhouse in Sioux Falls has been complete for nearly a year, but many have yet to see inside what will be the epicenter of the Sanford Sports Complex along Westport Avenue between Benson Road and West 54th Street. Inside this massive 160,000 square foot building, called the Pentagon, are nine basketball courts. Sanford Sports Complex General Manager Eric Larsen said, "There's actually nine courts in this facility and September 3rd we take over five of those and we'll get the next four in the middle of September." Six of them are high school regulation, two are professional or college ball practice courts and the most exciting, will be in the center of it all. Larsen said, "We're putting the chair back bleachers in now, that's one of the last pieces that will go in before they complete the floor." Almost complete, the Heritage court does exactly what's it's supposed to. 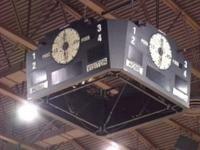 With it's old school scoreboards and it's dark hardwood, it brings you back to a different time; a 50's and 60's feel. "It's definitely old school. When they put something more in, it takes it back a little bit more. The main court is a parkay, darker color kind of like the old Boston Garden," said Larsen. The court may be NBA size, and the games professional in nature, but the setting will be nothing short of intimate. "You're not going to be any further than 19 rows away from the court when you sit in here so with the Timberwolves and Wisconsin, you're going to get to see to some really class athletes up close and personal to watch them play," Larsen said. between the Minnesota Timberwolves and the Milwaukee Bucks. Tickets for the game go on sale Tuesday at noon at Ticketmaster.com. Tickets start at $65 and court side tickets are $200. There are 3,250 total tickets available for game. On Nov. 8, the University of Wisconsin and St. John's University men's basketball will also play on Heritage Court. People will also have a place to stay before the games are played. The 80-room Fairfield Inn & Suites at the Sanford Sports Complex is almost complete. It is expected to open in September. There's also a restaurant being built on the more than 162-acre property. Beef O' Brady's, a sports restaurant and pub, will open it's doors Oct. 1. The Sioux Falls Ice Sports Association will open the Scheels IcePlex in September of 2014. The Sioux Falls Tennis Association's Community Indoor Tennis Center is scheduled to open in late 2013.